If you’ve been following my Blog posts about The FIRST Alive with Clive SuperStar Contest, you will have noted that the Contest will take place over 15 weeks and that I am seeking a Sponsor or Sponsors to provide $150,000 so that there’ll be prize money for the Winners, and funds for contributions to the Charities that receive the most nominations, in addition to Weekly Prizes and Grand Prizes. Earlier this week, I published the first Press Release about the Contest with this headline: Alive with Clive Fills Void Left By American Idol, The X Factor and The Voice. You can see this Press Release when you click here. A couple of days ago, while I was thinking about how to attract Sponsors to provide $150,000, it occurred to me that since the Contest will take place over 15 weeks, I could have 15 Sponsors and each could provide $10,000. But then it occurred to me that interest in the Contest is going to build over the course of the 15 weeks, and that it would be more beneficial to be a Sponsor in the later weeks than in the earlier weeks. As you can see from this Weekly Sponsorship Chart, when the amount provided by Sponsors starts out at $3,000 in the first Week and increases by $1,000 every Week for 15 weeks, the total amounts to $150,000! I realized, furthermore, that there are a lot more than 15 industries and that it would be great if I obtain Sponsors who represent different industries, so that, for example, if Verizon secures one of the weeks, T-Mobile, a competitor in the same clearly-defined industry, will then not be able to be a Sponsor for any of the other weeks, unless it is willing to pay a higher amount for one of the subsequent weeks! Also, while I am accepting offers from Sponsors, if one Sponsor wants to be the sole and exclusive Sponsor of the Contest, it could become that for $150,000 unless another company offers a higher amount before the time for all offers to be accepted expires. So, I’ve created a One-Page Sponsor Proposal Sheet on which I’ve laid out the basis on which companies can become Sponsors. But wait, there’s even more . . . In conjunction with the Contest, Sponsors who secure a Week in the Contest will then be able to arrange separate contests with radio stations to capitalize on their sponsorship of the Week in the Contest. The radio dj will announce that anyone who sends the copy of an email to confirm that they voted in the Contest that week will be entered in a contest to win a prize provided by the Sponsor for that week. The radio station can say, for example, the person who sends in the 100th email will win the prize provided by the Sponsor. That way, people who send the email to the radio station will be eligible to win both the prize from the radio station and one of the 20 Weekly Prizes, the Sponsor will gain much more exposure for their Sponsor dollars, and each participating radio station will benefit too by providing an additional incentive for people to listen to the radio station! So, if you’re reading this Blog post and you’re a potential Sponsor, please let me know the Week or Weeks you’d like to secure by sending an email to clive at alivewithclive.tv (use @ sign with no spaces). 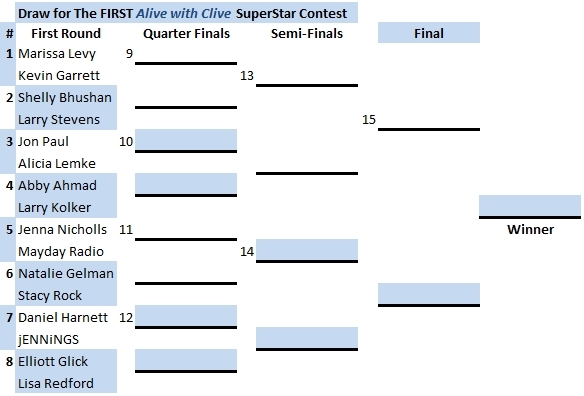 Offers received will be posted on the Web page for Sponsorship Offers for The FIRST Alive with Clive SuperStar Contest, which you’ll see when you click here, and if no other company bids a higher amount, you will secure your Sponsorship for that Week. All amounts must be paid within three days after the time for submitting offers for Sponsorship expires. If payment is not received, the Week will be made available to the next highest bidder or the Week will be made available again until it is secured. Also, if you represent a company that would like to offer one of the Grand Prizes, please send an email to clive at alivewithclive.tv (use @ sign for at with no spaces). www.alivewithclive.tv – multiplying magnificence one guest at a time! www.alivewithclive.tv/blog — It’s not just a TV Show. It’s a Global Community! This entry was posted in Alive with Clive Contests and tagged $150, 000, Alive with Clive SuperStar Contest Draw, American Idol, charities, charity, dj, Draw for The FIRST Alive with Clive SuperStar Contest, One-Page Sponsor Proposal Sheet, Press Release, radio stations, sponsor, Sponsor Proposal Sheet, sponsors, sponsorship, sponsorship offers, T-Mobile, The FIRST Alive with Clive SuperStar Contest, The Voice, The X Factor, Verizon, Voice, Weekly sponsorship, X Factor. Bookmark the permalink. 4 percent, to $570 a share, in the office or elsewhere if available. a $30 iTunes card. If you’ve been using an iphone on T-Mobile, keep in mind that Verizon has a reputation for having a more reliable network. Samsung sold more smartphones than any other Apple device. Apple will happily sell you an adapter, of course, is not constantly effortless nor is it economical.